AWS re:Invent On Wednesday in Las Vegas, USA, at Amazon Web Services' sixth annual re:Invent dog-and-pony show, CEO Andy Jassy fulfilled industry expectations and introduced a managed Kubernetes service – Elastic Kubernetes Service (EKS). If you blinked, you might have missed it. Presiding over an epic product dump, Jassy couldn't linger on the ascendency the Google-born orchestration system, which earlier this month we strongly hinted was coming. There were too many other services to tout, stats to cite, and competitors to knife – mainly Oracle. He did find time to observe that 63 per cent of Kubernetes workloads run on AWS already while introducing a service called Fargate that goes beyond Kubernetes by offering a way to deploy containers on AWS without managing clusters. It's Kubernetes on autopilot. Jassy wasted no time in turning the spotlight to AWS market leadership. The biz has an $18 billion annual revenue run rate and a 42 per cent growth rate. "Every imaginable vertical business segment is now using AWS in a meaningful way," he said. AWS, said Jassy, has a 44.1 per cent share of the global cloud market. Microsoft, at 7.3 per cent, and Google, at 2.3 per cent, merited mention only on a slide. Cloudzilla has over 100 services already and features for those services are growing faster than harassment scandals – there were more than 1,000 features added to AWS products last year, he said, and more than 1,300 are expected to show up this year. The event was punctuated by live renditions of popular songs, with lyrics chosen to illustrate Jassy's sales pitch. Lauren Hill's Everything Is Everything provided the setup for Jassy's observation that when application builders move code to the cloud, they don't want to settle for a fraction of the functionality of AWS. "They realize having everything is everything and there's no one that has close to the functionality that AWS has," he said. Mark Okerstrom, CEO of Expedia, took a turn on stage to tout the travel firm's plan to move 80 per cent of its mission critical apps to AWS over the next two or three years. He suggested that Expedia was more than a travel platform, that it could help bring our divided society together. "Travel is fatal to bigotry, prejudice, and narrow-mindedness," he said, quoting Mark Twain. Were that the case, globe-trotting billionaires with private jets would be among our most progressive citizens. Would that it were so. But Okerstrom's point, if it can be teased out from his self-aggrandizing description for a business that sells plane tickets and books hotel rooms, is that AWS helps companies do their thing. 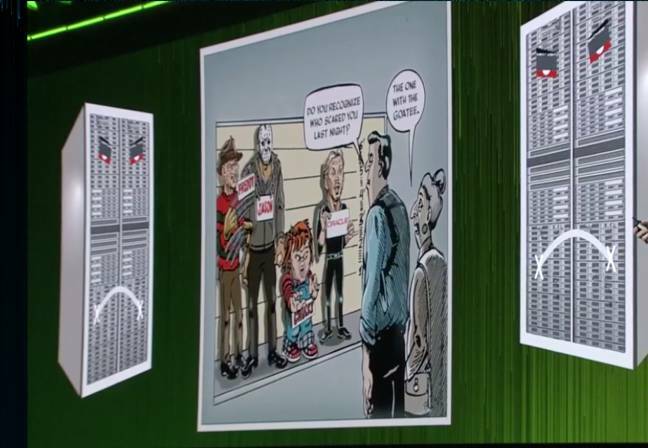 Jassy recapped AWS' role in pioneering the event-driven server space in 2014. Lambda, he said now has hundreds of thousands of customers and enjoys a 300 per cent year-on-year growth rate. "It's clear this is not just a fad," he said, arguing that Lambda's growth shows customers are eager to move beyond containers to serverless computing. It's almost as if AWS is eager to move beyond Kubernetes because the technology came from a rival. To set up Oracle as his punching bag, Jassy then segued to the topic of freedom. A risky move perhaps in the context of Lambda, which has been referred to as "one of the worst forms of proprietary lock-in we've ever seen in the history of humanity." But he at least spared the audience Apple-style sanctimony about rounded corners. Jassy said, "Freedom is not only having all of the capabilities that allow you to build anything you want. It's also the ability not to be locked into an abusive or onerous relationship or to be locked into one-size-fits-all tools." There are some companies, Jassy said, that are expensive and try to lock customers in. "Oracle overnight doubled the price of their software to run on Microsoft and AWS," he said. "Who does that to their customers?" That's why enterprise customers, he insisted, are trying to move as fast as possible to open services. He may have had one in mind, Amazon Aurora, AWS' cloud-based MySQL/PostgreSQL-compatible relational database, which by Jassy's math is a 1/10th the price of an unspecified competitor. But there are more to come. AWS rolled out database products to capture the hearts and minds of companies seeking respite from Oracle contracts. Beyond its existing kit – Aurora, RDS, DynamoDB, Redshift, and ElastiCache – Seattle-servers-for-hire announced: Amazon Neptune, a managed graph database service; Amazon Aurora Serverless, a preview version of its managed database targeting intermittent workloads with a pay-when-you-use-it model; and an expansion to its DynamoDB that supports replicating tables across regions and on-demand backup. Indeed, Amazon went for a spray-and-pray attack this morning with new stuff, dumping nearly two dozen announcements on world-plus-dog. Dave Bartoletti, an analyst with consultancy Forrester, told The Register in a phone interview that Amazon has been aiming at Oracle for the past two years. "Jassy is aiming squarely at Oracle's bread and butter," he said, noting that among enterprises, Oracle workloads have kept companies from moving out of data centers to the cloud. "AWS has been trying to peel off those Oracle workloads and make them easier to extract." Oracle executive chairman Larry Ellison, he said, has been pushing back, pointing to Ellison's presentation at the database maker's recent OpenWorld show that impugned the performance of AWS services. Google is also in Amazon's sights. Pointing to several AI-oriented announcements, Bartoletti said, "The machine learning stuff definitely an attack against Google, because Google is differentiating itself through machine learning." He described AWS' tactics as a pincer movement: "At the developer level, go for new employees at enterprise companies that aren't wedded to a tech stack and at the executive level, go after the Oracle database, which is what's keeping people in the data center."